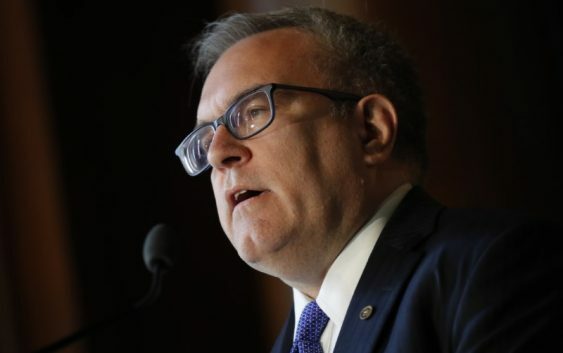 WASHINGTON (Reuters) – Acting U.S. EPA chief Andrew Wheeler told lawmakers on Wednesday he would welcome any deal between the auto industry and states like California that might result from a long-awaited Trump administration effort to roll back vehicle emission rules. The Trump administration’s proposal on vehicle fuel efficiency, which would roll back Obama-era standards, is expected to include plans to freeze tailpipe emissions limits at 2020 levels through 2026. It is also expected to revoke California’s power to set state emissions rules that are tougher than the federal government’s and mandate the purchase of electric vehicles. The proposal, by the Environmental Protection Agency and the Department of Transportation, will be released on Thursday, an administration official said on the condition of anonymity. On the eve of the release, Wheeler told a U.S. Senate hearing that any deal between the auto industry and California and the 12 other states that follow its lead on emissions limits would be well received, as the parties digest the proposal and the EPA moves to issue a final rule. “I would certainly welcome such a compromise,” Wheeler said in his first congressional testimony since former EPA administrator Scott Pruitt resigned last month under a cloud of ethics controversies. Wheeler’s openness to a deal on fuel efficiency signals a more measured approach than Pruitt’s to rolling back regulations, which could help ensure that changes will not be quickly reversed in the courts. Wheeler is a long-time Washington insider, while Pruitt was a former attorney general of Oklahoma who had sued the EPA many times before being appointed to run the agency. The administration’s proposal will contain a range of emissions cutting plans from a “flat line” approach on emissions levels to keeping the standards that former President Barack Obama had outlined, Wheeler said. The flat line, apparently referred to the freezing of the emissions requirements to 2020 levels. The proposal, which will undergo a public comment period before being finalized, is expected to intensify a legal battle between the EPA and California and the states that have adopted its emissions rules. Eliminating California’s electric vehicle mandate would also hurt automakers like Tesla Inc <TSLA.O> and General Motors Co <GM.N> that are investing billions of dollars in EVs. Regulators forecast freezing national emissions standards after 2020 would increase U.S. fuel consumption by about 500,000 barrels of oil per day an government source said last month. Government regulators also estimate the regulation, which they name the Safer and Affordable Fuel Efficient (SAFE) Vehicles rule, will cut traffic deaths by reducing the cost of new vehicles with enhanced safety features. A freeze would reduce the average fleet fuel economy standard from a current projected level of 46.8 miles per gallon in 2026 to 37 miles per gallon, according to an early draft of the proposal. Democratic senators slammed the plans to freeze emissions limits and stop California from issuing separate standards, saying that it would kill technological incentives to make cars more efficient and raise fuel bills for consumers. Senators from corn producing states also criticized Wheeler’s agency over its handling of a waiver program from the nation’s biofuel laws for small refineries. The EPA, under Trump, has significantly increased the number of waivers, drawing criticism from farmers that the agency is undermining the U.S. Renewable Fuel Standard. The controversial issue cuts across two of Trump’s core constituencies of farmers in the nation’s heartland and blue-collar workers at refineries. Wheeler pledged to bring more transparency to the program and consider ways to force larger refineries to blend higher volumes of biofuels like ethanol into their fuel pool to make up for the gallons exempted at the smaller plants, but he said the agency may lack the authority. He also said the agency is considering expanding sales of higher ethanol blends of gasoline, but was less emphatic than Trump, who told Iowa farmers last week that they were very close to introducing the new rule.